How can I tell if I have dry eyes? Well, there are several ways to determine if you are a victim of dry eyes. In most, if not all, cases, dry eyes occur when your lacrimal glands (i.e. glands by your eyes) are unable to properly lubricate your eyes. In other words, your glands have a hard time producing a layer of moisture over the surface of your eyes. Tears are needed to cleanse your eyes – washing out debris and dust, protecting your eye from bacteria and lubricating your eyes. In some cases, your lacrimal glands simply cannot produce enough fluids to keep your eyes lubricated (i.e. moist), but in other cases, the quality of your tears are inadequate or poor, therefore causing dry eyes. Yet, dry eyes can also occur as a result of hormonal changes (i.e. menopause), autoimmune disorders (i.e. lupus, Crohn’s disease, rheumatoid arthritis, Sjogren’s syndrome (i.e. dry eyes and mouth), long-term contact use, antihistamines, Parkinson’s medications, anti-depressants, birth control pills, windy, dry and dusty weather conditions, blood pressure medications, diuretics, hepatitis, etc.). If you suspect that you are experiencing acute (i.e. temporary and intermittent) or chronic (i.e. consistent and long-term) dry eyes, it is important that you schedule an appointment with your ophthalmologist (i.e. eye doctor). Thankfully, there are ways to determine whether a doctor’s appointment is warranted. If you are wondering if you have dry eyes – you have come to the right place. This article can help you determine if you have dry eyes. If you suspect that you have dry eyes – blink several times. If you blink your eyes and they still remain dry, you more than likely have dry eyes. In other words, those without dry eyes can blink their eyes several times to moisten them when they become dry. If you constantly have trouble with dry, scratchy, itchy and/or stinging eyes – take a good look at your home and work environment. Do you tend to spend long hours staring at a computer screen at work? Do you sit close to an air conditioner and does it blow in your face? Are there florescent lights in your home or office? If the answers to any of these questions are “yes,” you probably have dry eyes. Air conditioning, staring at a computer screen and florescent lights can trigger or aggravate your eyes, leading to acute or chronic dry eyes. If you suspect that you have dry eyes, examine them. In other word, look into your mirror. What do you see? Are your eyes red? Do they burn, itch, sting and/or feel like sandpaper? Does it feel like something is in your eyes? If the answers are “yes,” there is a good chance you are experiencing dry eyes. It is important to note that some eye conditions such as: sty, conjunctivitis (i.e. 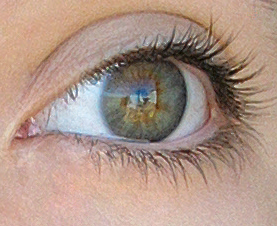 pink eye) or small pieces of matter floating in your eye fluid, can also cause these symptoms. If you are experiencing these symptoms, it is important that you contact your ophthalmologist as soon as possible. If you are experiencing what feels like dry eyes, but you are at work or have little time for a doctor’s appointment, at your break or in-between errands, purchase “natural tears.” Be cautious when purchasing eye drops because some can actually worsen the dryness. Stick with “natural tears” and stay away from “artificial eye drops.” If your eyes feel better with the “natural tears,” more than likely you are experiencing acute dry eyes. In other words, you should not need “natural tears” to moisten your eyes, but if you do then that is a sign that you are experiencing dry eyes. Furthermore, if you constantly have to re-wet your eyes with “natural tears,” schedule an appointment with your ophthalmologist as soon as possible. He or she can prescribe eye drops that are more similar to your own natural tears. If you have tried everything to resolve the dryness you feel in your eyes, but nothing has worked, it is time to see your ophthalmologist (i.e. eye doctor). You may have an eye infection that requires antibiotics or your may have an eye condition that can be treated with prescription medications. Regardless, it is imperative that you schedule an eye exam with your eye doctor immediately so that your vision is not permanently impaired. ← Am I a Good Candidate for Lasik Eye Surgery?